When 2 became 1... Became Complete. After 2 years of marriage, Renee finally requested the 'engagement ring' to match the wedding band I made back in 2007. 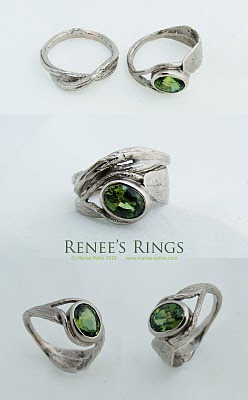 This ring has been 3 years in the making and with such beautiful clients as Renee and Kriss, the design was the result of patience for all the elements to come together (and for me to finally return to my bench). I have always enjoyed making jewellery for this couple as they have such appreciation for nature that I can design with immense creative freedom. These rings were cast from found willow branches and leaf collected from one of my many hikes in the 3 years living in Tasmania. The stone is 1.62ct Australian Sapphire set into 18ct Pd White Gold. Catching up with Renee and Kriss recently took me back to when i was living in this quaint little house in Launceston making their wedding rings from Willow branches I sourced from a local river bank, and the Maritime College. My living room was filled with twigs and leaves that fed the fire to toast my marshmallows as I worked. They were special times in a special place.